N E S T // a moment of secluded retreat, of warm shelter. A nest conjures that which we protect and nurture, and a haven for our own refuge. Our next gathering is November 24th. A pause between the busyness of the year and the busyness of the season, this is a deeply personal experience to reacquaint with the breath and the feelings we can foster when we take good care. A chance to tune out, tune in, reset. 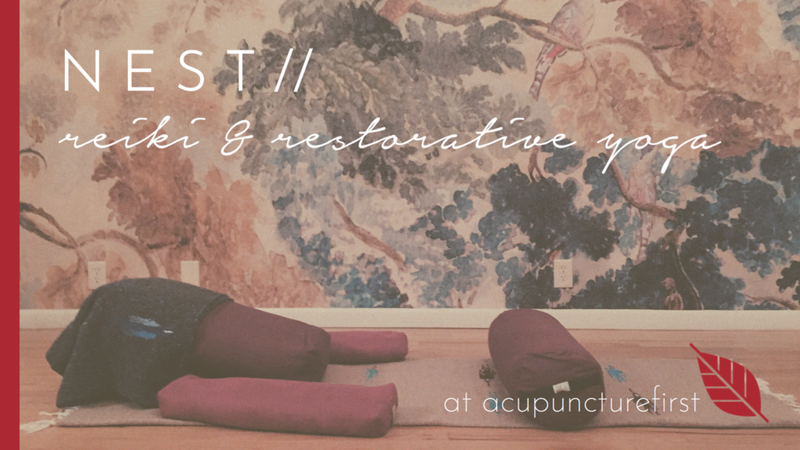 Restorative Yoga is tender and pervasive work, creating subtle openings in the body and mind through passive practices that ask us to let go and observe. Reiki is a Japanese modality of energetic healing, approached as intuitive touch, and comforting connection. Yoga Nidra is a profound and sacred guided meditation technique that allows us consciously observe our rest while deepening our subtle awareness. We'll take our time, settling in and burying ourselves deep so that we might re-emerge compassionate, capable and collected. This session is limited to five, to ensure the personal and attentive space that we create together. Investment (in yourself and my work) is $55.